It's weird when you see characters that you're used to seeing in a typical American comic style portrayed as manga characters. Especially when it's Batman. The dissonance would normally be enough to dissuade me from picking up Batman & the Justice League, but since I got the preview edition in a bundle that was bought for me, I felt like I should give it a chance. Keep in mind that this volume only covers the first two chapters, so if there's anything else that comes up in the regular first volume, then I cannot comment. 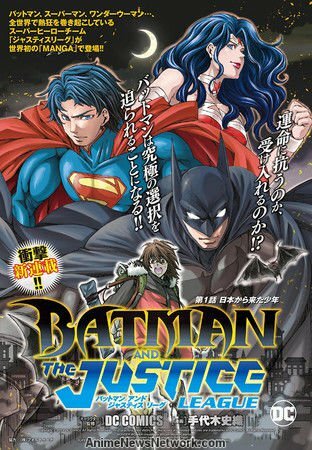 Gotham City is no place for a tourist, but a Japanese boy by the name of Rui Aramiya finds himself drawn there after his parents disappeared in a power plant explosion there. Everyone keeps telling him that there's no way that they could have survived, but until he can see the proof for himself, he refuses to believe that. At the same time, Batman is once more in confrontation with the Joker, fresh from killing Jason Todd. But there is something strange afoot and he may need to bring in support from his colleagues in the Justice League. I wanted to like Batman & the Justice League, but it just doesn't work on any level for me. This can be split largely into two points: the artwork and the plot. While the artwork is good, it just doesn't work for Batman, and that frustrates me so much. The characters are expressive, everything is clear and easy to follow, but it's just the completely wrong tone. Batman and Commissioner Gordon shouldn't look like they walked out of a men's fashion catalogue mere minutes before their entrance in the manga. Worse than them though is the one glimpse that we get of Jason Todd, where he is so ludicrously baby-faced and innocent-looking that you have to remind yourself that this is the Robin introduced stealing the Batmobile's hub-caps. I have a few issues with the plot. First is that it starts with ley lines, the least Batman-appropriate plot point that I could possibly think of. Second, while I appreciate that I've only read a couple of chapters, I don't think that Rui storyline fits tonally with whatever Batman and Joker are doing. With the Batman stuff, it was more-or-less typical cat and mouse game, while Rui is both wide-eyed idealist tourist and a ninja. I've technically seen Batman in stupider situations, but it's still weird seeing some random civilian pull out smoke bombs. If they were working together, I could probably understand how the plot could be pulled off, but the early events makes it clear that Rui is seen as a nuisance. So I'm not really sure how it will go from here, and to be honest I'm not especially interested.